Sierra Wave Solar Link 1000 (#9675) is a portable Solar Generator Power Center, capable of providing over 1000 watt-hours of power distributed through two AC 120V outlets, two DC 12V marine grade plugs and two 5V USB power outputs. Solar Generators don't require fuel, don't put off any fumes and do not make any noise. This top of the line Solar Generator has a true 1000 watt pure sine wave AC inverter providing a clean consistent power signal to operate high tech electronics, appliances and tools the same as plugging into the power grid. The Solar Link 1000 has a Lithium Iron Phosphate Battery also known as a LiFePo4 battery, considered by many to be the best batteries available for use as the heart of a Solar Generator. Lithium Iron Phosphate Batteries have 3 to 4 times the life cycles as AGM batteries and are typically a third of the weight! Don’t be fooled or settle for buying a generator with a AGM battery (marketed as a fighter jet battery) that appear to be a such a great deal at 50% off an extremely inflated MSRP! In reality if an AGM battery has a 500 cycle life expectancy and the Solar Link 1000 has a 2,000+ life cycle expectancy, which is the better deal? Wouldn’t you rather pay a little more up front and get a generator that will last 4 times as long, and weight 60-70% less? Do your homework and you will see that buying the Solar Link 1000 is a “no-brainer” v/s competing generators with AGM batteries. The Solar Link 1000 Generator may be charged using either the included 120V AC charger, or the Sierra Wave 120-Watt Solar Collector unit (Solar Panels Sold Separately). The Solar Link 1000 also features a state-of-the-art battery management technology making it the most, reliable, powerful and lightweight power system on the market. The whole generator unit only weights 56 lbs. and doesn’t require wheels or casters like many of competing brands using heavy AGM batteries. The Solar Link 1000 Solar Generator is made is the USA, and comes with a 1 year manufacturer’s warranty. Solar Link 1000 enable self-reliance and peace of mind in the advent of an emergency or disaster for the home, farm, cabin, or work site. Also great for recreational use for camping and other outdoor activities. Please keep in mind that while the Sierra Wave Solar Collector panels are weather proof, the Solar Link 1000 is not weather proof and needs to be kept dry and does pose a danger of shock. 100-Watt AC Refrigerator: 9-14 hours depending if it’s just starting up or already cold. To estimate how many hours the Solar Link 1000 will operate your appliances or equipment using the 120V AC outlet, find the watt hour draw of the appliance or equipment you want to power and divide that into 920. (Example: One 10-watt light divided by 920 = 92 hours of continuous light). 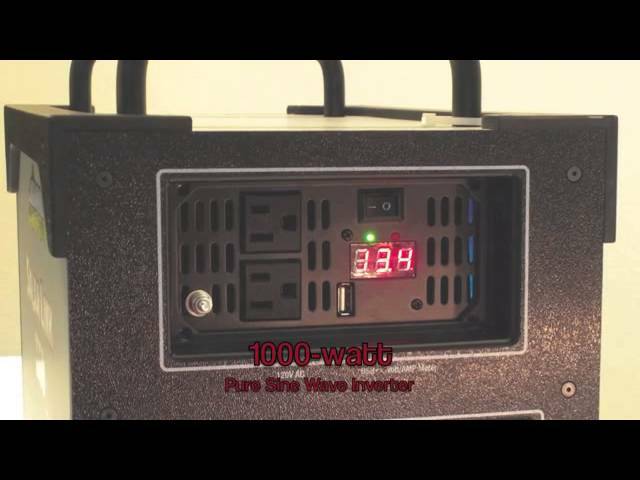 Pure Sine Wave Inverter Information: Do not use any AC device above 920 watts. An in-line protection fuse and overload protection circuit is included for added safety. Pure sine wave power is suitable for most AC devices and power supplies used in electronic equipment, transformers, and motors. Aervoe Industries and the Zion Gear Company assumes no liability for use with medical equipment or life support systems. This unit is designed to be used with Sierra Wave 120 Watt Solar Collector Panels.